You’ve been eating right and exercising for a while, but that stubborn belly fat just won’t budge! Along with incorporating foods that fight fat into your diet, here are some ways to burn that pooch away while you are out on a run. Switch Up Your Pace Intervals are proven to reduce belly fat and rev up metabolism; instead of running at the same pace for the entire workout, try alternating between periods of pushing your body to the max and periods of recovery. Here’s a list of interval workouts for you to try: 45-minute fat-burning treadmill workout 300-calorie-burning walking-jogging workout 30-minute pyramid intervals Swimming interval workout 45-minute walk-run-sprint workout 45-minute elliptical interval workout Go a Little Longer Unfortunately you can’t spot treat when it comes to weight loss, which is one reason why solely doing crunches won’t whittle your waistline. The key is to decrease overall body fat, and the one way to do that is to burn calories. Lengthening your workout will do just that. 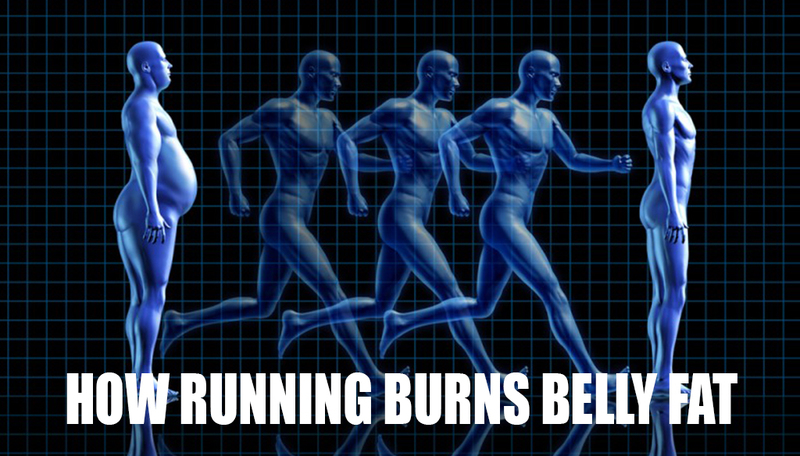 Every five minutes of running at a 10-minute-per-mile pace burns about 45 calories. Think about that on your next run, and it’ll motivate you to keep going! High Knees You’re working hard to diminish your overall body weight, which will slim down your belly, so you can reveal toned abs underneath. Here’s one way to strengthen your core. Do one-minute intervals in which you run with high knees (like in this cardio workout you can do in your living room). Concentrate on using your abs rather than your leg muscles to kick your knees up as high as you can. Try This Killer Treadmill Move Here’s another core killer if you’re using a treadmill. Set the pace to 1.0 mph. Place your feet on a Plyo Box that’s set up about two feet behind the back of the treadmill. Come into plank position with your hands straddling the treadmill belt. Step your hands on the belt and start walking, keeping your torso in one straight line. Do this for one minute, pulling your belly in toward your spine.